AllegroMedical.com presents The Sa-Wan Thai Herbal Ball Starter Kit 20 Body Treatments. The Sa-Wan Herbal Ball is a traditional hot therapeutic treatment that can be pressed along the Sen Sib lines, acupressure zones, and more to increase blood flow and lymphatic drainage. The Sa-Wan Ball can be used in combination with traditional Thai or Swedish massage or as a tool to work on specific parts of the body that need special attention for muscular tightness or pain. 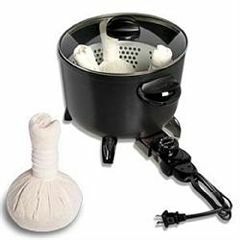 Steam the herbal ball for 10-15 minutes. Gently press the herbal ball on the affected area or the whole body for relaxation.